October has officially begun! Believe it or not, that means Halloween is creeping up around the corner. There are plenty of ways to celebrate this spooky holiday throughout the Cleveland area. We’ve gathered a collection of kid-friendly Halloween events to ensure all ages are involved in the festivities this year! 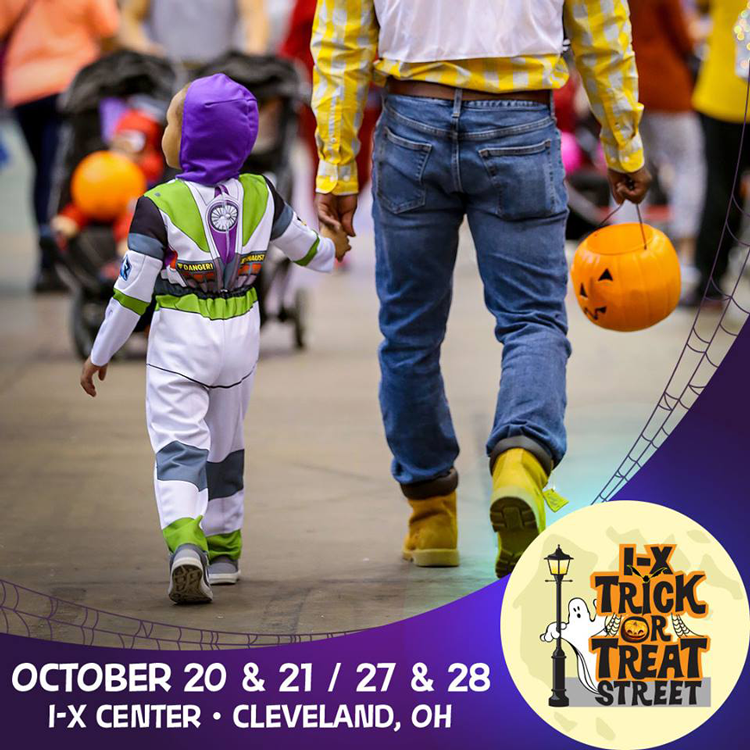 From trick-or-treating at the zoo to costumed pet parades and 5Ks to train rides, don’t miss these kid-friendly Halloween happenings throughout the Cleveland area this October. October 6 | 10 a.m.–4 p.m.
Get the Halloween festivities started early at the Holden Arboretum! This annual family-friendly, not-too-scary celebration offers endless daytime trick-or-treating for costumed little ones in a festive garden setting. Plus, decorate a scarecrow for the annual Scarecrow Row competition to win prizes! Admission to Goblins in the Garden is $15 per car for members and $25 per car for non-members. 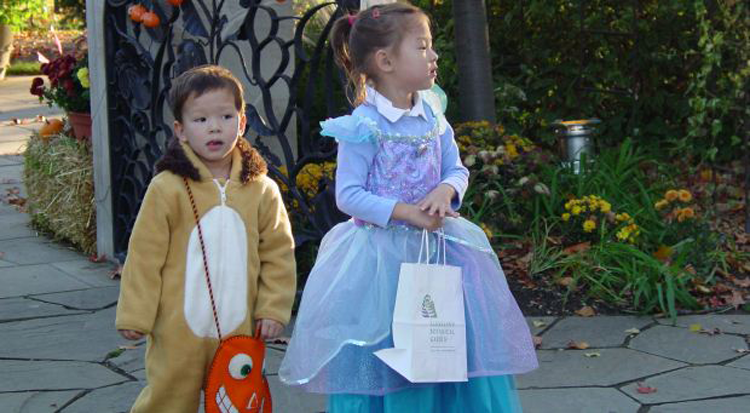 October 12–14, 19–21 + 26–28 | 5–9 p.m.
Boo at the Zoo is considered Cleveland’s sweetest Halloween tradition. And you have three weekends to enjoy the festivities at the zoo, including treat stations, unlimited 4-D Theater movies, carousel and train rides, a hay maze, a Monster Mash dance party, and much more. Tickets are $10 for members and $11 for non-members in advance, or $14 for both members and non-members at the door. Head to the Carlisle Reservation in LaGrange on Friday and Saturday evenings throughout October for a non-spooky and/or spooky Halloween experience (depending on your preference). The Halloween Fair includes a non-spooky family-friendly trail from 4:30–6:30 p.m. and a haunted trail from 7–10 p.m. Plus, enjoy the Little Green Choo and tractor-drawn wagon rides, midway games, music, and endless entertainment. Admission is $2 per person and free for children 3 and under. October 13 | 6:30–8:30 p.m. Put on your finest costume and head to the Downtown Pavilion in Cuyahoga Falls for the Monster Mash, a family-friendly event with a light dinner, a DJ and dancing, photo opportunities, and a Halloween treat bag for kids. Tickets for the Monster Mash are $12 for residents and $14 for non-residents. October 13–14, 20–21 + 27–28 | 11:30 a.m.–7:30 p.m.
Take a walk on the wild side at the Akron Zoo. Dress your little goblins and ghosts, grab your own treat bag or bucket, and go trick-or-treating at 12 themed treat stations spread out throughout the zoo. 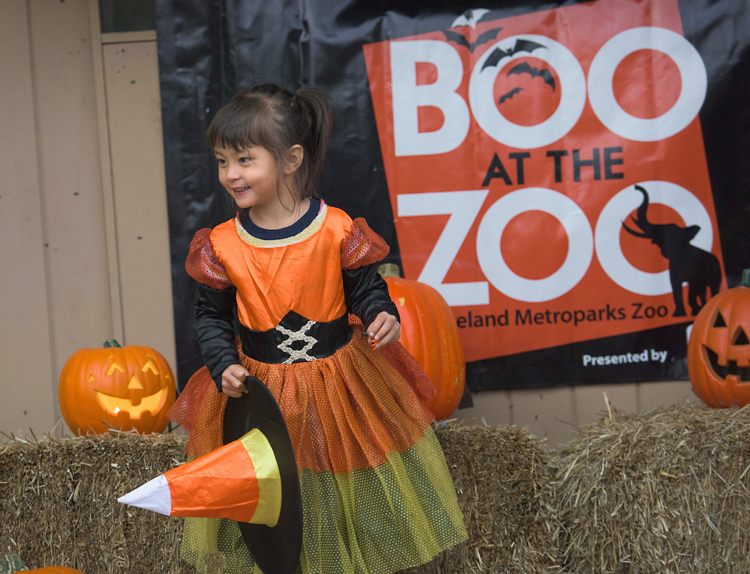 Boo at the Zoo is happening on Saturdays and Sundays from October 13–28! Get more information about ticket pricing. 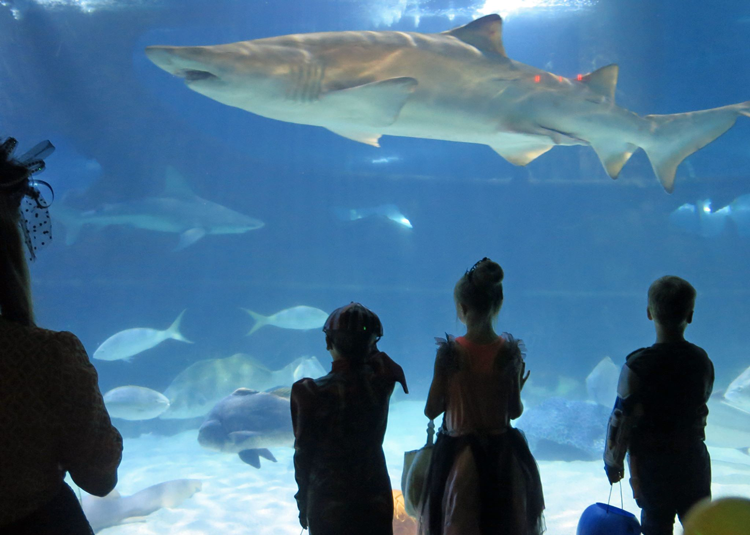 October 19–20 + 26–27 | 6–9 p.m.
Hunt for treasure at this unique pirate-themed Halloween party at the Greater Cleveland Aquarium! Activities include a magic show, face painting, animal encounters, games, a DJ-ed dance party, a trick-or-treat trail, crafts, pumpkin animal enrichment, costumed scuba divers, and various special appearances. Tickets are $12 for non-passholders (both adults and children) or $10 for passholders (both adults and children). Children under 2 years are free. October 20 | 12:30–3:30 p.m.
We can’t leave our four-legged family members out of the Halloween fun! LakewoodAlive invites all dogs (and their owners) to the 11th Annual Spooky Pooch Parade at Kauffman Park in downtown Lakewood. The festival starts at 12:30 p.m. and the parade kicks off at 2 p.m., followed by an awards ceremony announcing winners for a number of categories, including Best Dog and Child, Best Dog and Adult, Best Dog and Group, Spookiest Pooch, and Best in Show. Register your dog to participate in the parade for $10 in advance or $15 the day of the event! October 20–21 | Saturday: 10 a.m.–8 p.m. + Sunday: 12–5 p.m.
Boo-tanical Bash offers a weekend of endless family-friendly fun amidst a beautiful setting at the Cleveland Botanical Gardens. The bash runs from 10 a.m.–8 p.m. on Saturday and 12–5 p.m. on Sunday. Tickets are $10 for members and $15 for non-members; advance registration is required! October 20–21 | 1:30–3:30 p.m.
All aboard for The Pumpkin Party! Head to the Cuyahoga Valley Scenic Railroad Rockside Station for an afternoon of pumpkin decorating as the train travels throughout Cuyahoga Valley National Park. You’ll be equipped with a pumpkin, craft supplies and crafty assistants ready to help, plus beverages and other snacks available for purchase. All you need to do is come dressed in your finest costume and purchase tickets in advance! October 20–21 + 27–28 | 11 a.m.–7 p.m.
Don’t miss this exciting Halloween tradition at the International Exposition (I-X) Center! Trick-or-Treat Street features creatively themed and not-so-spooky Halloween houses dishing out candy, plus pony rides, kiddie rides and live entertainment. Get your tickets for $13 in advance or $14 the day of! October 26 | 6–8:30 p.m. 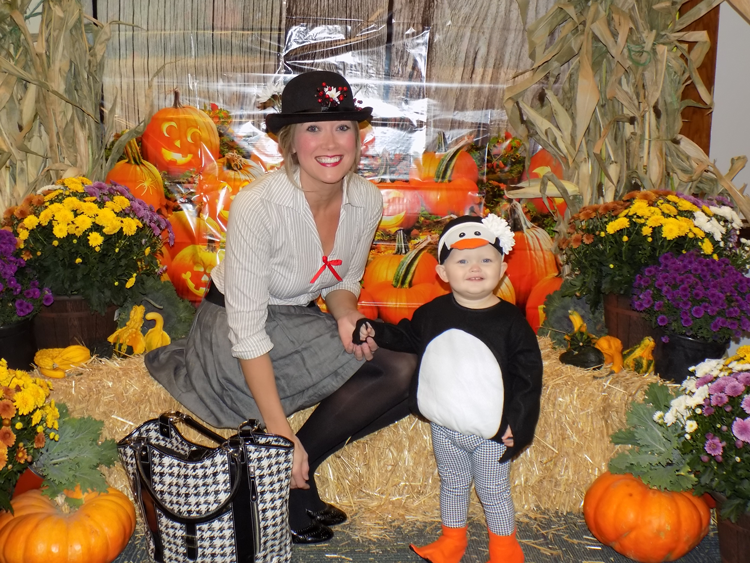 The 21st Annual Boo’seum at the McKinley Museum provides an evening of endless fun for all ages! Enjoy trick-or-treating throughout the museum, $1 hayrides (weather permitting), science shows, planetarium shorts, a scavenger hunt, hot dogs and other snacks available for purchase, and much more. Tickets are $5 per person (membership benefits do not apply). October 27 | 10 a.m.–3 p.m.
Get up close and personal with wildlife at the Cleveland Museum of History. Learn about the serious business of animal enrichment and see animal ambassadors at work and play. Plus, enjoy games, crafts, pumpkin decorating and special animal demonstrations — all in a not-so-spooky setting. Animal demonstrations will take place every hour from 10 a.m. to 3 p.m. in the Ralph Perkins II Wildlife Center & Woods Garden. Admission is free for members and free with general admission for non-members. October 27 | 7:30 a.m.
Get moving at this exciting race throughout Kamm’s Corners, featuring both a chip-timed 5K and a non-timed Little Monster Candy Dash. 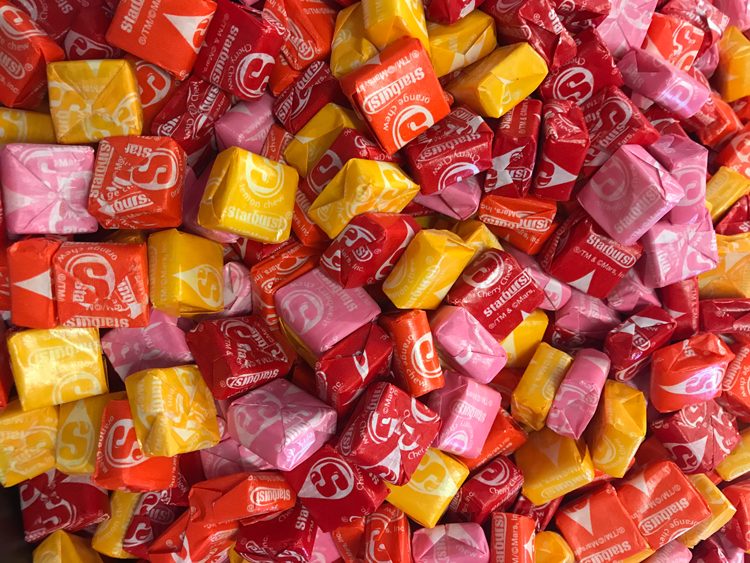 Before the 5K, kids 8 and under will line up and make a mad dash for Halloween candy along a short route. The 5K is followed by a post-race party, featuring brunch and drink specials, a Bloody Mary and mimosa bar, a costume contest, and much more. Registration is $30 in advance and $35 the day-of for the 5K, and $10 for the Little Monster Candy Dash. October 27 | 9 a.m. Participate in the 17th Annual Halloween Run for Justice, which benefits the Ohio Lawyers Giving Back community outreach programs, including the 3Rs, which helps students in the Cleveland and East Cleveland City Schools. 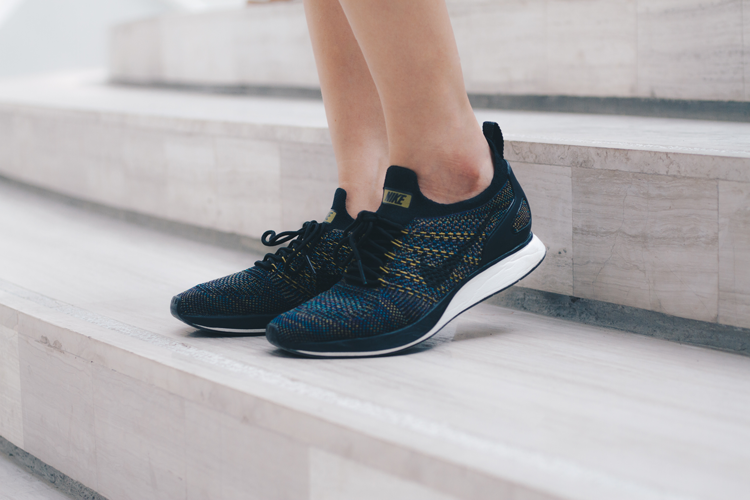 Races include a non-timed 1-mile walk/fun run, a 5K walk or run, and a 5-mile run! Registration is $25 before October 15 and $30 after October 15. October 27 | 12–4 p.m.
Sylvan Learning presents this special Howl-O-Ween celebration for kids and pups alike. The day kicks off at 12 p.m. with a vendor village and food trucks, along with a pet costume contest. Kids can go trick-or-treating starting at 1 p.m. and live entertainment begins at 1:30 p.m. Admission to this event is completely free and entry to the pet costume contest is $5 (all proceeds go to the Cleveland Animal Protective League). October 28 | 3–4 p.m.
Good Shepherd United Methodist Church offers a fun alternative to trick-or-treating with Trunk-or-Treat, where community members decorate their vehicles and pass out candy to children 12 and under. This event is completely free to attend! October 31 | 3–4:30 p.m.
Don’t miss the first annual Cuyahoga Falls City Hall Trick-or-Treat tucked inside the city’s Municipal Building. Different departments will be participating in this free and festive community event! What events are on your calendar this Halloween season? Let us know in the comments below.